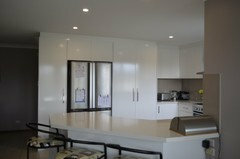 What Colour Splash back ????? Need advice .... 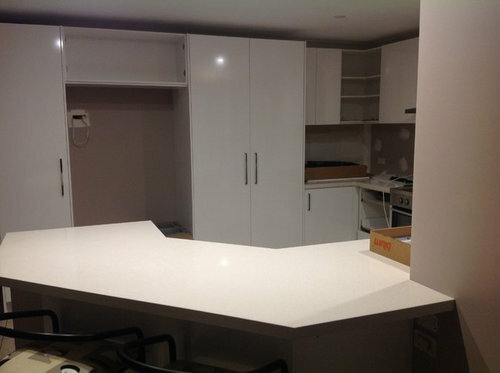 Walls are Taubmans "Indecision" bench top is caesarstone "ice snow", with cupboards in a semi-gloss. 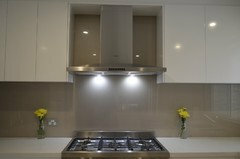 We have decided on a Glass Splashback, but are stuck on what colour to go with. 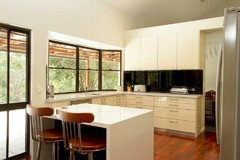 For a sleek, modern look try Black Glass. 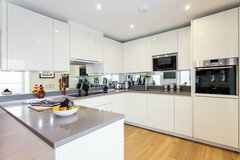 It gives the appearance of a mirror, but doesn't double the 'mess' of the kitchen. With the multi-changing led lights, I would suggest silver. an alternative for you ..... 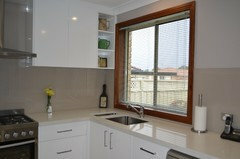 I used very glossy and very large (600mm x 600mm) white tiles. Could easily use black tiles with black grout. 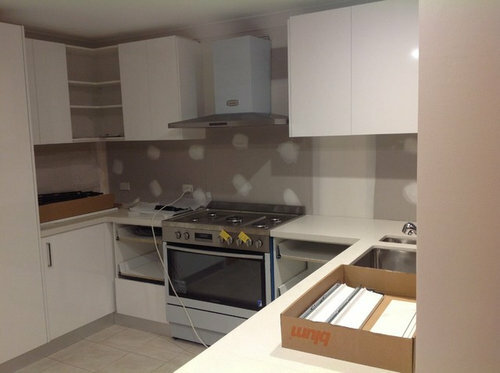 Because they're on the wall, there's almost no visible grout lines and just about everybody has thought they are a glass splashback. Reflects the light ... and for approx. 20% of the cost. Smoked mirror or if you want just glass, the clear painted white which gives the pretty Aqua colour. 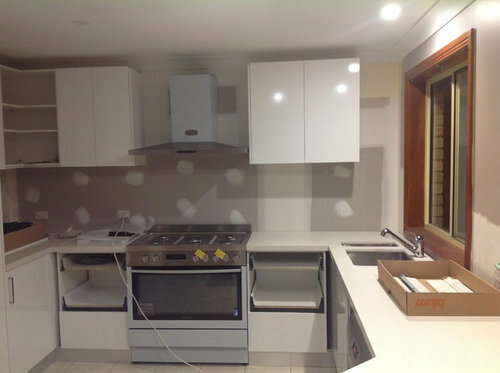 I definitely would NOT go dark on the splashback. The area appears quite dark in the photos so I'd try an make it as light as possible. Think about during the day with no lights on? 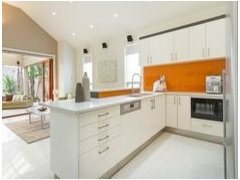 With the wall colour being earthy and the timber windows I'd go with a light orange for warmth and brightness. 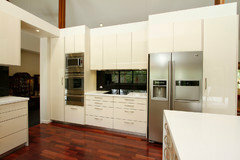 Or stay neutral with white and add colour with accessories. To complement your wall colour 'indecision', what about an blue like Taubmans 'Night Palace'. Or if following advice to go lighter, then 'viola blue' or 'star trek' are complimentary. Save me from grey!!! 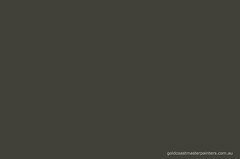 The whole world has gone grey... Grey cars, to match grey roads and grey skies, and to complete it all now we have 50 Shades of.....ANYTHING But. Chose a colour that you have used elsewhere. I agree with the comment not to go too dark - too difficult to keep clean. 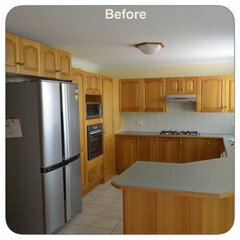 You should do something like this that I did for a client...see attached image. What a lovely space you have to play with ! 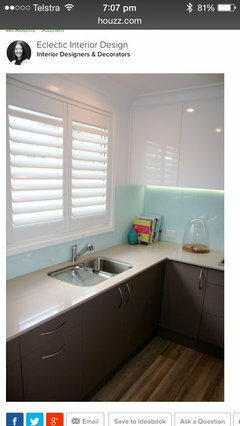 I agree with the suggestion of plain glass giving a soft and light Aqua look. I wonder if the photo is true to colour suggesting a darker area ? Perhaps dark colours would only exaggerate that. I have a glass splash & it's so low maintainance it's a dream !! Good luck. 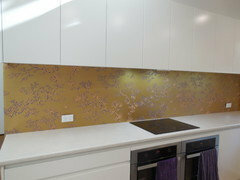 Have you considered a stone splash back same colour as your bench? Have done this before and looks fantastic. I have also done this in my new house with London Grey stone, simply magic. 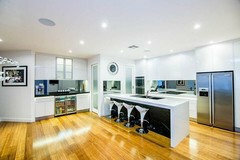 I find that dark glass will show heaps of streaks especially when you cook with steam etc. looks great in a display, just not practical. Either way, your kitchen is looking great. Great to see what you did! Are you comfortable with it? 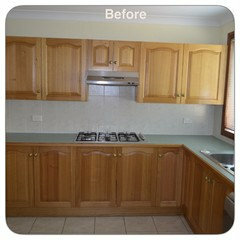 Yveeb, your old kitchen looks like mine only bigger, I love what you have done . Good choice, it looks great. Hope you're enjoying it now that it's all settled in. Hi, have you considered smokey mirror? 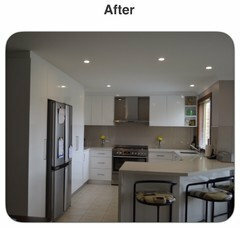 We did a full home build recently with the kitchen and bar both with smokey mirror splash backs. Looks great and gives lots of wow factor. Cleaning isn't so bad either. 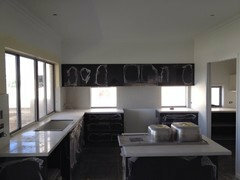 More pics on our projects page if you're interested. 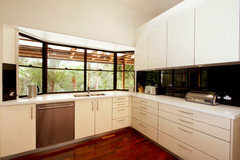 Yes, large black tiles will work with a cream kitchen if you didn't want to go with the glass. 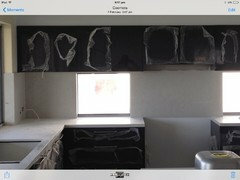 This photo is of glass, but can give you the idea of black and cream. Good luck! 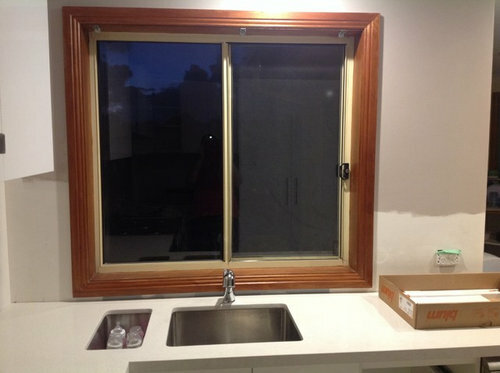 Kitchen Tiled splash back colour?